Before starting this program I really struggled with making healthy food choices, binge eating and eating disorders. I was at a point where I felt like i was eating good meals because I made all our food from scratch. not using packets and bottles for flavors, I would bake rather than buy biscuits etc. However I would then eat all my baking,I was over eating and eating the wrong portions and types of foods. I had stopped breast feeding and was noticing a ring around my waist that bulged over my pants or was uncomfortable in high wasted pants. I was dressing to my current size rather than my current style. I wasn’t worried about my weight, I wanted to change my mindset about the way I looked and thought about food. I wanted to have a good relationship with exercise and I wanted to feel better within myself. My skin was breaking out and looking lacklustre. When I saw the BMP pop up on FB I felt like it was perfect timing. I spoke to an amazing lady and felt instantly like I needed this program and everything that I was offering. 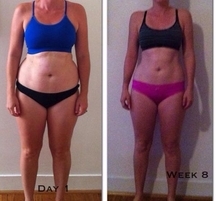 What I have found with this 8 week challenge is that I am capable of anything. My stomach is so much flatter,I think gluten is responsible for my bloating and am so happy to continue life without gluten. My skin is clearer, warmer and less puffy. I feel more toned and so much more confident. My clothes fit so well now and have even had to sell some clothes to buy more. Especially pants! What I enjoyed the most out of this program is the support!! I actually can’t believe how much the support makes a difference. Posting every day held me accountable, it made me excited and kept me healthily competitive. I have met friends through the fb page that I will be in touch with forever. The knowledge guidance and support from Cathy (our PT) and Kelly has been incredible and so well organized. If I could say one thing to another mum looking at doing this it would be to put yourself first for once. The better off you are the better off everyone around you is because you are the rock and glue of your family. Get your head in the game and follow all the advice you are given it all leads to better choices and decisions. These girls really know why they are doing!